Watch this video on. And learn how to get yours free! Greetings to all vinyl collectors. 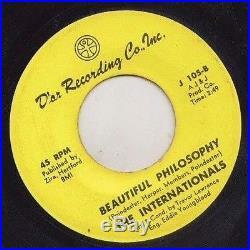 “Too Sweet To Be Lonely”/”Beautiful Philosophy” by The Internationals on D’ar 45 RPM 7(J 105). Glossy vinyl in visual EX- condition, kindly check the player. Labels as presented (please see pictures). You can save a couple dollars with them , but it’s going to take time… Feel free to ask, we’ll be glad to assist finding out the solution that fits you better. Please note that we cannot be held responsible for the performance of the carrier of your choice. Much more hot tunes coming , stay tuned… Thanks for shopping and take good care. 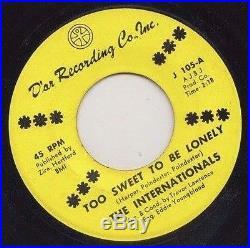 The item “D’AR NORTHERN SOUL 45 INTERNATIONALS TOO SWEET TO BE LONELY glossy ex-” is in sale since Sunday, August 02, 2015. This item is in the category “Music\Records”. The seller is “joespinner116″ and is located in Kingston, St. Andrew. This item can be shipped worldwide.